HOW TO KNOW BETWEEN MEASLES AND CHICKEN POX? Measles and chicken pox are most common diseases that affect children. Both have certain similarities but actually they are caused by two different viruses – Paramyxo Virus and Varicella Zoster Virus, respectively. The first sign of being affected by either of them is the appearance of rashes on the skin. Another common aspect is that both measles and chicken pox are contagious and spread through coughing, sneezing or coming in contact with the infected person in one way or the other. A person can get vaccinated from measles but not against chicken pox. When a person is affected with measles there will be splotch rashes, high fever, cough, sore throat, white spots, runny nose, soggy eyes and body ache. The difference in symptoms for chicken pox include high fever, skin rashes, loss of appetite, red or pink bumps on the body, headache and tiredness. There is a difference in the duration of measles and chicken pox. A few days after the rashes appear on the body, a person with measles will feel sicker compared to those with chicken pox. Chicken pox patients will have stomach upset, irritability and trouble with itching, but the symptoms gradually reduce along with the fever. But in the case of measles, people will feel sick longer, suffer from fever, fatigue and achiness with running nose, coughing and watery eyes. 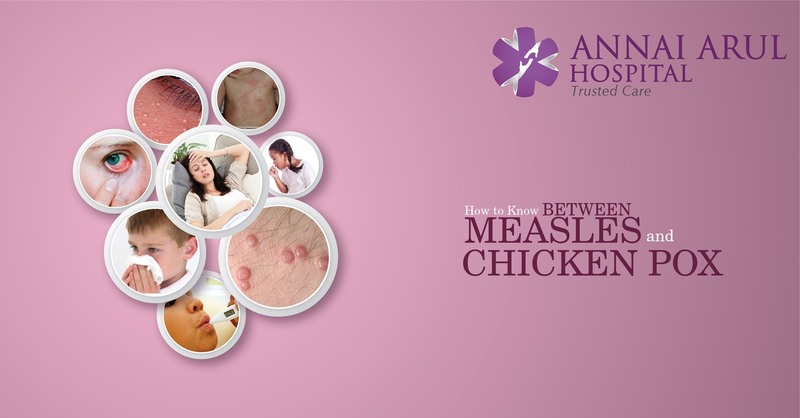 When it comes to treatment for measles and chicken pox, there are lot of similarities. First of all people suffering from both diseases are suggested to take complete rest, then get properly hydrated with some seasonal juices and most importantly advised against vigorous scratching of the skin which will only aggravate the itching and leading to more rashes developing. People with measles are usually advised to drink lot of water and ingest Vitamin A rich food substances in their diet. Those with chicken pox are told to take regular baths with lukewarm water, apply unscented lotions on the body and wear as lightweight and softer clothes as possible.